The day the sale of our farm closed, I picked nearly all the remaining fruit in the orchard, but I had to leave the persimmons. They were the biggest crop I’ve ever had, on a tree at least fifteen years old but still barely taller than I. What bothered me most was that, thanks to the unusually long, hot summer, the persimmons were sure to ripen completely for the first time—to turn bright orange and lusciously sweet, as persimmons regularly do in California. So I was especially grateful when a fellow Master Food Preserver offered me a big box of squat, nonastringent Fuyu persimmons. She had gotten them from a relative who didn’t know what to do with them. They had been left on the tree through weather in the low twenties, and so in places they were as soft as a ripe Hachiya (the acorn-shaped variety that is astringent until fully ripe) while in other places they were quite firm. But still they tasted very, very good. And they had arrived just in time for me to make a few into toothsome holiday treats. I’ve based the recipe that follows on one apparently created for the little American persimmon—a native Eastern fruit that I’ve never yet had the opportunity of tasting—and for another American native, the black walnut. This nut is worth a try if you have a black walnut tree in the neighborhood and don’t mind the husking and shelling. I substituted fat, sweet English walnut meats from a local friend’s old tree. The original version of this recipe called for dark brown sugar, and I sometimes prefer it for its richer color and taste. But light brown sugar lets you taste more of the persimmon’s own delicate flavor. To extract persimmon flesh, scrape or spoon it from the skin, discarding any seeds. If you use Hachiyas or fruits of another astringent variety, be sure they are fully soft. 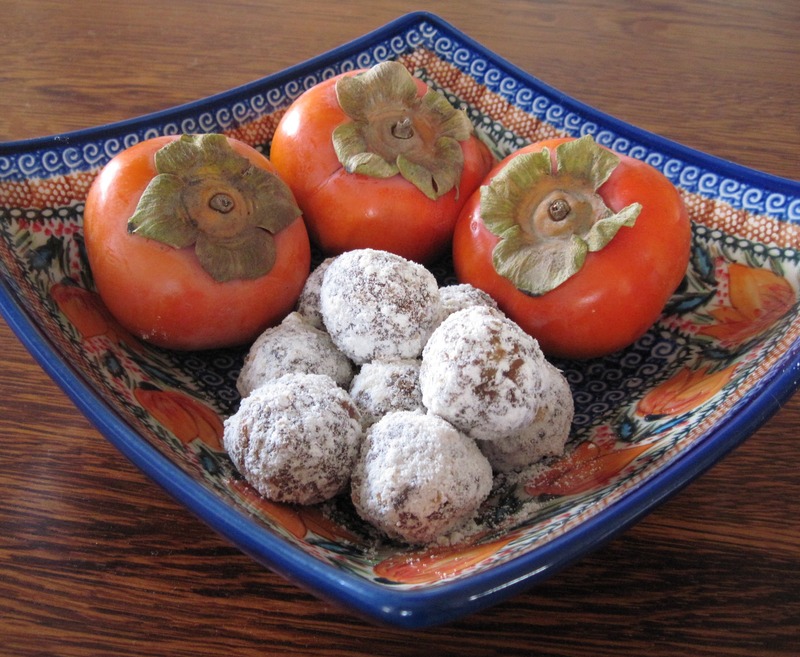 Persimmons such as Fuyu can be used when quite firm. Firm flesh will need chopping. Chop 1 cup of the walnuts, and put them into a heavy-bottomed saucepan. Grind the remaining walnuts with the confectioner’s sugar in a spice grinder or blender. Set this mixture aside. Add to the saucepan the persimmon pulp, sugar, egg yolks, and butter. Cook the mixture over medium heat, stirring often at first and then constantly as the mixture thickens. Continue cooking until the mixture forms a ball that pulls away from the side and bottom of the pan, or to 230 degrees F. This will take about 20 minutes. Remove the pan from the heat, and let the mixture cool for about an hour. Then form it with your hands into 1-inch balls, and roll each ball in the sugar-walnut mixture. When the balls are completely cool, store them in an airtight container. 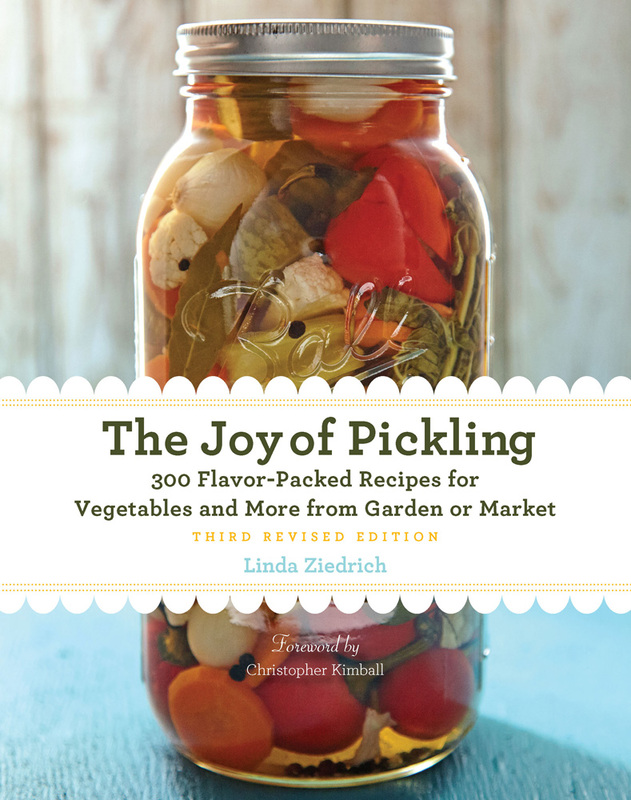 This entry was posted in Fruits and tagged candy, desserts, Fuyu, gluten-free, Hachiya, persimmon chews, persimmons, recipe. Bookmark the permalink. Wonderful–it’s been a banner year for persimmons apparently, because my local grocers have been well stocked. I’ve been scooping out hachiyas and eating the pulp with yogurt (so good with rice pudding too), and I have scored many fuyus for salad, but this looks like a better plan! I even have a pile of black walnuts from my neighbor’s tree, but I think I’ll leave those for the squirrels (too much messy hard work for me). 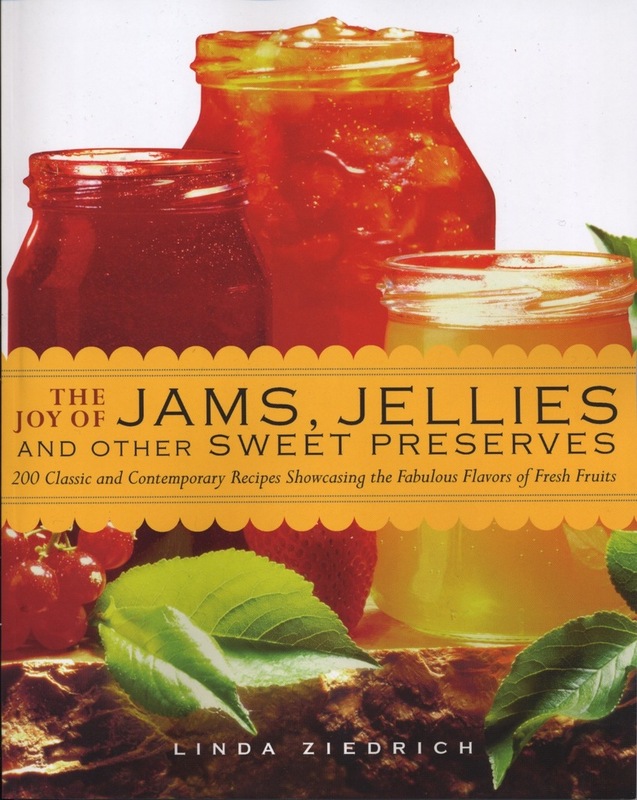 My holidays will be full of jam, jelly, and marmalade–and for that, I thank you! You are not missing much on the native persimmons–they have so little pulp and the taste does not make up for it. They are a lovely tree though. especially in the sand hills habitat they are often found in. For the persimmon chews, as I will be traveling a lot next week–how long can I expect these to hold up unrefrigerated? Val, I hope this answer isn’t coming too late. Because you’ll be cooking nearly all the water out of the mixture in order to form it into balls, the chews should keep unrefrigerated for months. My Dad used to tell me that when he was a boy he would sneak persimmons from a neighbor ladies tree, she of course yelled at him. He would tell me that when the fruit was ripe it was well worth it. We never had them when I was growing up in Alaska. I’ve seen the trees in magazines and they must be beautiful when full with fruit during the winter. Enjoyed reading this and the memories of my Dad that it evoked.